The crown, or vertex, is the area at the top of the head. It naturally features a spiraling or swirling or angled pattern to one side. 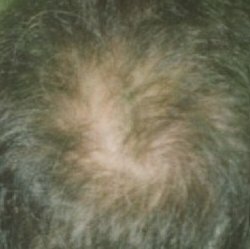 Men and women with male pattern baldness first experience thinning of hair at the crown and then hair loss at the crown.